Excel is also using the Move2Perform software to increase awareness among parents, coaches and athletes about injury risk and interventions by offering screenings which double as fundraisers for teams or clubs. Excel clinicians volunteer to screen the young athletes for a nominal fee, which is donated back to the team or club. It hits multiple goals at once for Excel: a community outreach opportunity to decrease youth sports injuries, awareness and education on a hot EBP topic, and a valuable marketing strategy. Greg Crossman has been instrumental in the implementation of evidence-based Return to Sport Testing Programing and injury risk screenings at Excel Orthopaedic Specialists using Move2Perform. The physician owned practice in Massachusetts includes a staff of 9 orthopedic surgeons, 4 physician assistants, and 26 therapists. The Move2Perform software is as an integral part of Excel’s commitment to objective return to sport decision-making, reducing injuries in youth sports and their community outreach efforts. Greg graduated with a bachelor’s degree in physical therapy from Northeastern University in 2000. He received his Doctor of Physical Therapy degree from Massachusetts General Hospital Institute of Health Professions in 2008 where he continues to teach part time as a teaching assistant and lab instructor. Greg has practiced in a variety of outpatient orthopedic settings over the past 10 years. He has experience working with a wide variety of patients from professional athletes including the Boston Bruins and New England Revolution to weekend athletes, geriatric and pediatric populations. 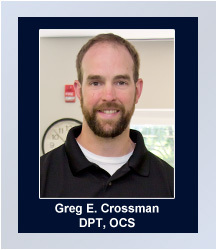 As a board certified Orthopedic Clinical Specialist and Maitland Certified Orthopedic Manual Therapist Greg employs a combination of manual techniques with therapeutic exercise and functional training to help patients maximize their functional status and achieve their goals.